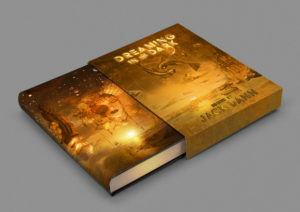 Dreaming in the Dark is launched! And so the Dreaming in the Dark anthology, the flagship publication of PS Australia, edited by the legendary Jack Dann has been launched. Dymocks in the city have several signed copies, so if you couldn’t get along tonight you know where to find copies – and I imagine Pulp Fiction Press will get in a couple of the limited edition signed-by-all version that PS is producing as well for the serious collectors! Madly signing the sheets for the super-duper limited edition. Jack Dann and a tale of beagles and wombat poop. This entry was posted in News and tagged angela slatter, Dreaming in the Dark, jack dann, janeen webb, jason nahrung, Kim Westwod, kim wilkins, Kirstyn McDermott, Paul Brandon, Venny Armanno. Bookmark the permalink. 2 Responses to Dreaming in the Dark is launched! Looks great. Will there be an ebook? Hiya. Don’t think so at this stage.